Get Your Helical Piles Today! As Southern Ontario’s leading source for affordable, high quality, fence and deck solutions, Premier Fencing can quickly manufacture a reliable, strong support system, for any given project. As a growing family business starting as Boyer Lumber and continuing to expand. We now also now offering a broad range of high-quality helical piles, helical piers and screw pile connectors in a variety of sizes, Premier Fencing can tackle any deck or patio application you require. What is Helical Pile Installation? Designed to ensure maximum support, helical piles are a steel screw-in piling and ground-anchoring solution, used to underpin structures ranging from homes, decks and patios. 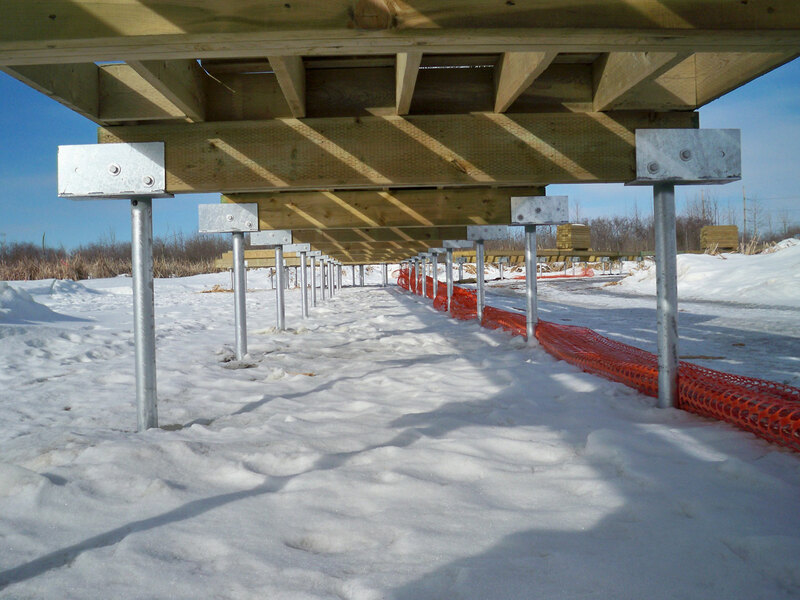 The hollow shaft, cut diagonally at the end for ground penetration, has a large helix attached to the lower exterior, allowing it to be screwed into the ground.Helical pile installation has changed the way foundations are built, replacing conventional poured and cast concrete footings. A low speed hydraulic auger is used to screw helical piers into the earth, using exact torque to achieve desired load capacities. Premier Fencing uses cutting edge, digital, systems, which allow us to provide a digital printout of each and every helical pile footing. Our operators are able to view live data directly from the cab allowing for a true torque reading, and consistency on every project. All of our helical piles are signed off on, upon completion, by our licensed and highly skilled installers. Screw piles date back to the early 1800s, and were used extensively in the foundations of lighthouses and harbor piers. Over the years, helical piles have found increasingly widespread use, including telecommunications, roads, houses and decks – wherever speedy, cost-effective installations are required, or when the work is near existing buildings. Manufacturers of modern helical piles claim they have a long-life expectancy – more than 150 years. In many cases helical piles will far outlast any deck, they can even be removed and re-installed on your next project. Helical piles have the built-in advantage of rapid installation as there is no need to mobilize specialized and messy excavation and concrete equipment. Their design allows for maximum use of soil capacity and immediate loading capabilities. 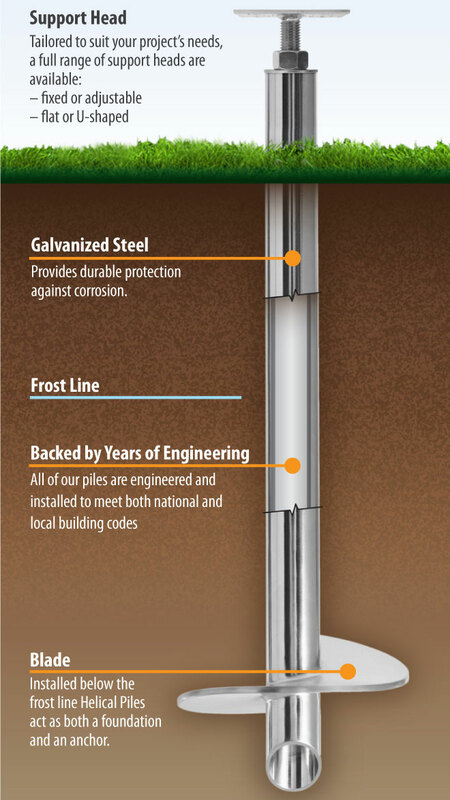 The screw piles thread into the ground, providing you with an installation that is fast and secure. Helical pier installation is ideal for small areas, close to other structures, because they are drilled straight into the earth, using modern equipment. Our machines only need 39” of clearance – roughly the size of a standard backyard gate opening. Installing helical piles is landscape friendly. 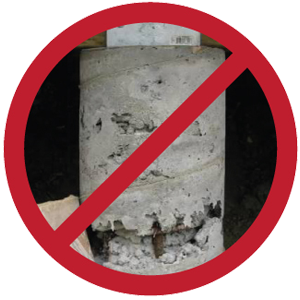 Helical piles are screwed into the ground and do not require any messy concrete or soil clean up. When installing your pile supports, our Premier Fencing crews always take care to preserve your landscape and do our best to leave it as it was before we arrived. Our Premier Fencing has been formally trained and licensed, we can confidently plan structural layouts of helical piles, for any deck or patio project. We can employ pile-to-structure connectors that are easily height adjusted for jobs. Our deck footing and decking supports provide the best foundation, bar none, for your new structure. With the capability to begin the helical pile installation and start construction on the same day helps to speed up project timelines. Not having to remove displaced earth or deal with concrete also saves time and money. No excavation is required with. 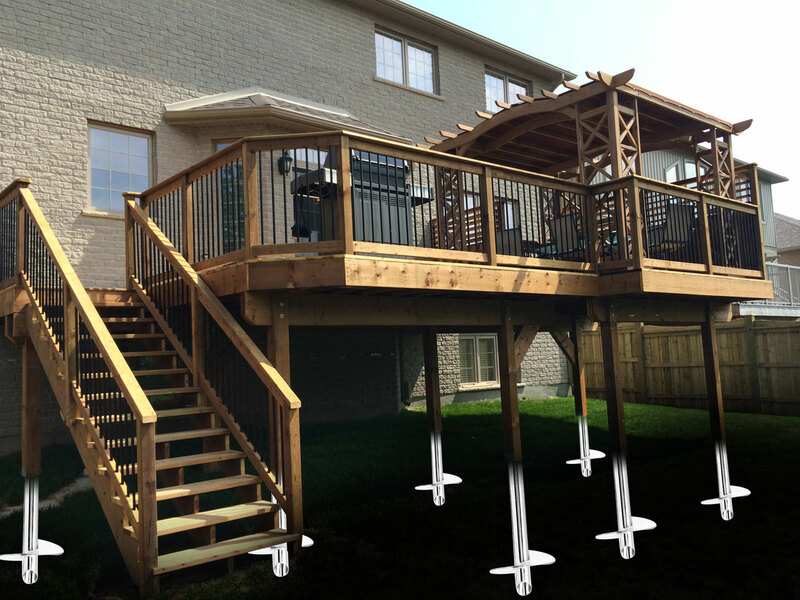 Before beginning any project, we ensure that the screw piles, deck footings and deck supports being used are well suited for your project. We work directly with the manufacturer and ensure their engineering design and specifications and being met and can cope with the most challenging loads and conditions. We use screw piles that are engineered to meet the Ontario Building Code, in case building permits are required for your job. Working torque-monitoring systems, we can ensure that the piles we install have high torque and load-bearing capacity, and won’t sink further into the ground later, unlike convention concrete footings. We can also provide site specific engineering for your project if required by your township. When choosing to move forward with your next project, invest your time and money into a company that will get the job done right. Our team at Premier Fencing ensure that our screw piles are buried deep, so the helix portion of the pile is anchored beneath the frost line. Our long experience in helix pile installation for decks ensures a safe, sound structure, backed by a two-year warranty. 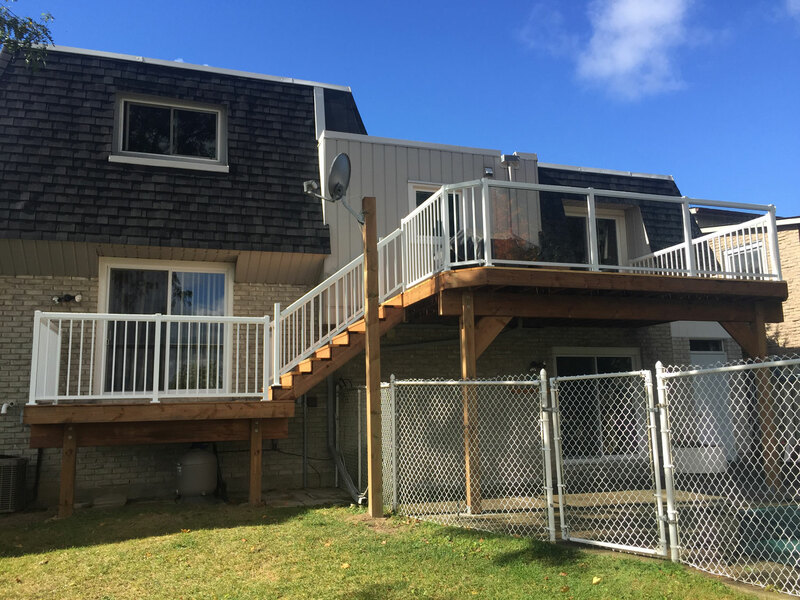 With over 90 year of experience, Premier Fencing and Deck Solutions has served the needs, and won the trust, of homeowners across Southern Ontario. Call us today for a fencing or deck solution that is high-quality, durable and competitively priced. Discover how you can get the performance of a traditional deep foundation system without the expense of high mobilization costs.